I don't know whether the public sincerely buys into the hollow, hateful delusion of the United Nations, and I certainly don't care. The UN is billed as a sort of clearinghouse for world opportunities and a chance to make the world a better, safer place. And, on some level, it is. Simply put, last week President Obama knew precisely where and when a few smart bombs or cruise missiles could have instantly and irreversibly improved world stability, and he did nothing. Indeed, he did far less than nothing, as instead of acting, he chose to talk. You know, like Neville Chamberlain. I am speaking of course about the latest meeting of the United Nations General Assembly. There, exposed and vulnerable, waited Muammar Gaddafi and Mahmoud Ahmadinejad, lured from the relative safety of their quasi-national strongholds into the cold light of serious reality. They were in New York, isolated from any protection. The saffron-scented cocoons of their suicide cult quasi-nation bordellos of hatred offered no protection from justice. Those dusky charlatans were never so vulnerable. 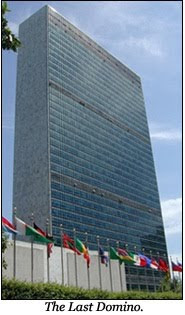 Even I don't know with any certainty how many other criminals and villains reported in for the latest iteration of the great farce that is the United Nations, though I recently had lunch with those who tell me that number could easily verge all the way into the double digits. It wasn't just Gaddafi and Ahmadenijad, those Marxist-Leninist Marx Brothers of hate-mongering. Bozhe moi, indeed. And Obama did nothing. Ours was not a President that day, but a mere dignitary in the real-world equivalent of the Model United Nations, only with monsters instead of school children. Very Lord of the Flies. Indeed, the United Nations really does work much better as a children's game, as it has no real place in the world of serious diplomacy and foreign relations. It it time for President Obama to wake up to the manhood of his presidency and cast away not only the childish, feel-good huggery-buggery of the UN, but also all the nonsense it — shall we say — "represents." As it happens, Dr. Martin Luther King, Jr. denounced the false "luxury of cooling off or... the tranquilizing drug of gradualism." He understood that now is always the right time to "make real the promises of democracy." Fittingly enough, the United Nations represents everything Dr. King denounced — unmanned do-nothing self-indulgence in the service of the wrong and of the evil. It is a salon in which the the dilletentes and flunkies of tyrannies and despotisms meet to badmouth and belittle what few truly great nations exist in our world. If President Obama is to demonstrate his true and binding commitment to world safety, he must follow Dr. King's lead, and cast off his own chains of over-tolerance. He must accept the inevitable truth that an omelette is nothing but an unborn, emasculate dream when it lacks a carton of smashed eggs as midwife and birthing blood. In New York City, we have roosted on an enormous egg, which has at some point gone stillborn, or been sucked dry by desert weasels (a close relative of the Desert Fox). There is nothing left to do but smash it.